Start this recipe at least a day ahead. Serve the pork and vegetables with mashed potatoes or with beans (like cranberry or cannellini) seasoned with pounded garlic, extra-virgin olive oil, and sage. Combine 2 tablespoons salt and 2 teaspoons pepper in a small bowl and rub the mixture all over the pork. Put the pork, fat side up, in a large roasting pan (about 12x16x3 inches). Cover and refrigerate overnight or for up to 3 days. Remove the pork from the refrigerator and let sit at room temperature for 1 to 1-1/2 hours before cooking. Position a rack in the center of the oven and heat the oven to 300 degrees F. Uncover the pork and roast until tender everywhere but the very center when pierced with a fork, 4 to 4-1/2 hours. Add the onion, carrots, garlic, wine, and 1 cup water to the roasting pan and continue to roast, stirring the vegetables occasionally, until the pork is completely tender, about 1 hour more. Remove the roast from the oven and raise the oven temperature to 375 degrees F. Using tongs, separate the pork into 8 to 10 large, rustic chunks and spread out on the pan. If most of the liquid has evaporated, add a splash more water to the pan to create a little more juice. (It shouldn't be soupy.) 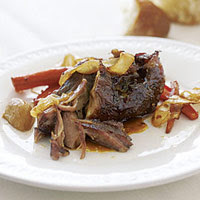 Return the pork to the oven and continue to roast until nicely browned on the newly exposed surfaces, about 15 minutes. Remove the pan from the oven, transfer the meat and vegetables to a serving platter, and tent loosely with foil. Let rest for 20 minutes. Skim the excess fat from the juices and serve the juices with the vegetables and meat. This entry was posted on 9:53 PM and is filed under Pork . You can follow any responses to this entry through the RSS 2.0 feed. You can leave a response, or trackback from your own site.